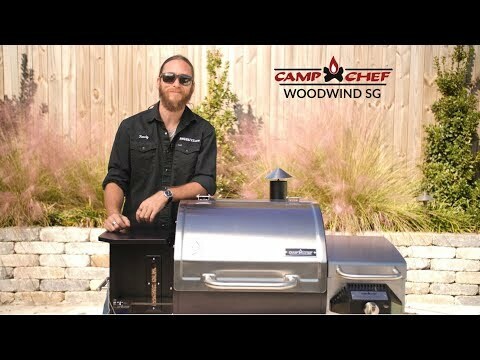 Camp Chef has combined the superior grilling capabilities of the Woodwind and the versatility of Slide and Grill technology to create the Woodwind SG. Slide and Grill technology allows you to switch between direct and indirect flame cooking with just the pull of a knob. With the digital temperature display, simple temperature settings, and an exclusive ash cleanout system, this grill will have you spending less time monitoring your grill and more time enjoying the outdoors and a delicious meal. The Woodwind SG is constructed of durable powder coated steel with a stainless steel lid and fire box. It features a 429 square inch enameled steel primary cooking area and a 382 square inch, 2-piece nickel plated upper rack. This gives you a total of 811 square inches of cooking space, all heated by 25,000 BTUs of cooking power. The 2-piece upper rack is also height adjustable, giving you more room for taller food with having to completely remove the upper rack. With the simple temperature selection system, the grill can be set to temperatures as low as 160 degrees for smoking and up to 500 degrees for the perfect sear. Once you have chosen your desired temperature, the digital display can be toggled between showing the grill temperature and internal food temperature, which is monitored by the included stainless steel meat probe. Smart Smoke technology keeps your Camp Chef pellet grill with 15 degrees of your selected temperature. The automatic auger dispenses pellets as needed from the high capacity hopper, which holds up to 22 pounds of pellets at once. A continuous fan insures that your grill stays evenly heated and smoky, so every bit of food is perfectly cooked. The Woodwind SG grill also features a Sear Box, which is a stainless steel, 16,000 BTU propane side grill that can reach up to 900 degrees. The Sear Box features a 184 square inch enamel coated cast iron grate for the perfect sear and heat diffuser plates to turn the flame into infrared heat. When you are done cooking, clean up is easy, thanks to the exclusive Camp Chef ash cleanout system. Simply pull open the trap door with the side knob and empty the ash cup underneath the grill. This grill also features a pair of large, heavy-duty wheels and a pair of swivel casters for easy rolling and maneuverability, a pellet clean out door so you can keep your unused pellets protected and dry between uses, and a powder coated steel bottom shelf. A hose, regulator, and holding bracket are included for a 20-pound propane tank (tank not included). Cooking Grid Dimensions 22 X 19 1/2"
The Woodwind Series of pellet grills are the best Camp Chef has to offer. The shiny stainless-steel hood and sturdy black painted steel cart will definitely make you take notice. Great features and loaded with cooking versatility, Woodwind grills are ready to grill, smoke, sear, bake or anything else you may have in mind. They have a wide temperature range of 160-500 degrees. The digital controllers have Camp Chef’s Smart Smoke Technology which keeps the grill within +/-15 degrees of your selected temperature. Camp Chef’s patented ash clean out system offers easy, no hassle clean-up. After you cook, pull the knob on the bottom right side of the grill and the ash is dropped down into an easy-to-remove ash cup for dumping. You’ll be ready for your next cook in no time with minimal effort. One of my favorite features is exclusive to the Woodwind SG models. 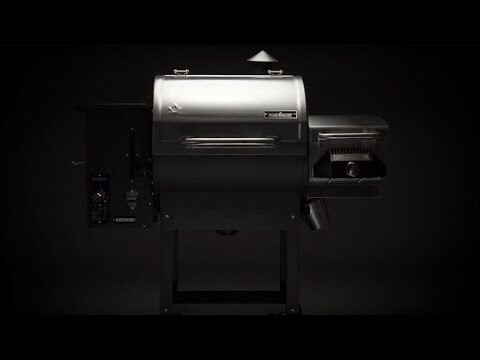 Camp Chef’s Slide and Grill Technology, allows you to switch from low and slow smoking to searing burgers, steaks and more over an open flame. Pull the knob located on the left side of the grill and gain access to the direct flame instantly. This feature is not available on non-SG models. Included with Woodwind SG models are two stainless-steel meat probes. The probes plug into the easy-to-use control panel. Toggle between temperatures on the display with the push of a button. Easily monitor the grill’s ambient temperature as well as internal food temperatures during your cooks. Non-SG models include one probe. All Woodwind models offer a 22-inch wide main cooking grate giving the grill 429 square inches of main cooking space. Woodwind SG models has two secondary cooking grates giving you a total cooking area of 811 square inches, while non-SG models have one secondary cooking grate for a total cooking area of 570 square inches. Woodwind SG has an extra-large 22-pound hopper, which is the largest hopper of any Camp Chef grill. Most popular brands of pellet bags are 20 lbs., so the hopper can accept an entire bag at once. This allows you to smoke food longer without having to check or add more pellets. This is convenient for long cooks or when smoking overnight. They also have window on the hopper to keep an eye on your fuel level. Non-SG models offer an 18-pound capacity hopper which is still considered large. The handy pellet clean-out door lets you easily change your pellet flavor or remove and store your pellets for your next cook. Simply ready your bucket, open the chute by pulling the knob located on the hopper. Traditionally pellet grills are associated with low and slow cooking; however, the Sear Box and Sidekick Woodwind models provide quicker cooking options, great for weeknight cooks. Their built-in ignitions allow you to be cooking in no time. Both are conveniently mounted to the side of the grill and powered by propane. Hang your tank on the provided propane tank holder. The Sear Box features a 16,000 BTU stainless steel burner and enameled cast iron grates. It allows you to get a quick high-heat sear. Perfect for getting a nice crust on steaks, grilling burgers and more. The Sidekick includes a flat top griddle with a ready-to-cook seasoned surface. The 30,000 BTU cast aluminum burner makes cooking a breeze. Remove the griddle and use the sidekick as a camp stove. While Woodwind SG models with Sidekick or Sear Box are the most popular models, the propane tank mounts to the back of the grill. This expands the overall footprint of the grill so keep that in mind when you are ready to store it when not in use. Also, non-SG models have less features, such as the larger cooking area, bigger hopper and Slide & Grill Technology. You want a feature packed pellet grill from a popular brand, that offers versatile cooking options at an affordable price. Can a natural gas line be used with the sear box instead of propane? Hi, Bryan. The Sear Box must be run on propane. It doesn't have the proper orifices and regulator to run on natural gas, and a conversion kit is not available. 22 X 19 1/2" 22 X 19" 22 X 19" 22 X 19"